The President’s Malaria Initiative Africa Indoor Residual Spraying (PMI AIRS) Project is not only protecting people against malaria but also providing much needed income for communities. In Rwanda, the additional income seasonal workers have earned through IRS campaigns has allowed them to improve their quality of life. For example, PMI AIRS Team Leader Nikuze Esperance, a genocide widow and mother of four, used her income to build a more stable home. Previously, she and her adult children lived in a one-room structure. The benefits of additional income from the IRS campaigns have gone even further as seasonal workers pay it forward. In two sectors of Gisagara District in Southern Province, the project’s spray operators are also community health workers (CHWs) familiar with those in the community who are in need. The CHWs decided to use part of their wages to help others. 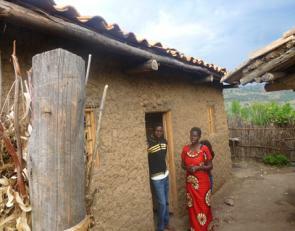 In Kansi Sector, spray operators built a house for community member Nyirandorimana Purcherie. “We had planned to make contributions when we received our wages from IRS to assist a needy person in the community. During the spray operations Purcherie’s house could not be sprayed because it had so many gaping holes on the walls. We thus agreed that we would build her a house which can be sprayed next time,” said spray operator Nzaramyimana Eugene. The pigs produce manure which can be used to boost the growth of the vegetables. Elated beneficiary Mukansanga Beatha promised to take good care of the piglet and generate manure to grow vegetables. She hopes the grown pig will produce its own piglets she can sell to generate more income and further improve quality of life for her family. Local leaders praised the spray operators for their outreach to community members and also thanked PMI for funding IRS activities in the sectors through which lives have been improved.